HomeBusinessDid Cash for Clunkers Help Auto Sales? »The state assistance in the stimulus act. Some would have happened anyway. People trade in clunkers and buy new cars all the time. CEA estimates that about 200,000 such new car sales would have happened in July and August without the program. Some people held off on purchases in order to participate in the program. If you were going to trade in a clunker in June, the creation of the Cash-for-Clunkers program gave you a big incentive to delay your purchase until July or August. CEA estimates that 50,000 sales were delayed for that reason. Some people accelerated purchases they were going to make later in the year. If you were planning to buy a new car in the fall, for example, you might have decided to go to the showroom a few months early in order to get in on this deal. CEA estimates that 90,000 sales were shifted forward from September, and another 20,000 were shifted from October through December (so the total forward shift in 2009 was 110,000). 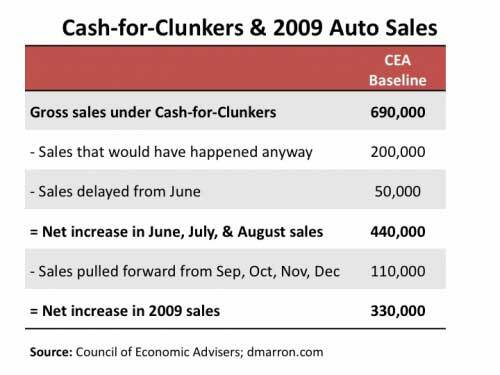 Putting those factors together, CEA estimates the net effect of the program was to lift 2009 auto sales by 330,000, less than half of total participation in the program. The Cash-for-Clunkers program cost about $2.88 billion, so one way to slice the numbers is to say that each additional auto sale cost taxpayers about $8,700 (=$2.88 billion divided by 330,000). Was that money well spent? That’s a hard question I leave for another day. A careful answer would require analyzing a host of factors including the short-term boost to GDP from the program (which CEA analyzes), the longer-term reduction in GDP from the program (due to lower auto sales over the next few years), the cost of paying off the $2.88 billion borrowed to finance the program, the environmental benefits of getting newer cars on the road, and the wealth loss from euthanizing the clunkers rather than moving them into the used car market. Note: CEA is careful to note that there are lots of uncertainties around each of its baseline estimates. It also reports a more pessimistic estimate (only 210,000 net new sales in 2009) and a more optimistic one (560,000).